When taking those first few steps into the mobile realm, it’s very easy to get hung up on the technology. Platforms, OSes, OEMs, handsets, carriers and then SDKs and browsers are seemingly hell bent on driving a wedge between you and your learners. Your learners, with their learning objectives and ultimate goals of productivity, efficiency and safety, have a number of cards stacked against them. Maybe they aren’t familiar enough with their phones to find their away around your non-mobile friendly CRM, Wiki or LMS. Perhaps they don’t have permissions to install new apps from the store that could help them accomplish their tasks faster. Whatever the factors at play, this wedge of technical divide and inability to reach the content they need presents a real problem for you as the mobile learning expert to deliver the content. Many of these issues are policy, publishing or procurement issues, though and largely solvable via the advice we’ve given here previously. Once these procedural issues are under control, your users are going to be hungry for content. You’ll need to carefully consider this content strategy before designing and developing your first apps or mobile web sites, though, because if we learned anything in the early days of the web it is that content is king. The right content can make or break the effort, effectively alienating users or producing your strongest advocates. Here at Float, we’ve identified four primary content areas on which you should focus your attention. In our view, if you haven’t filled at least three of these four areas, you aren’t thinking expansively enough about what your users are looking for in your content delivery strategy. This area seems to the first one that people look to fill when venturing into mobile. Why? Well, with years of content in their LMS and many learners trained into thinking that this is the way that things have to be, this type of mobile learning is easy to see as the “low-hanging fruit” of mobile learning. If you attended our certificate session at mLearnCon 2010, you’ll realize that there is no easy button for this. In that session, we discussed tool-based approaches to accomplishing this, as well as content repurposing strategy ideas. Many corporations seem to be involved in the early phases of this exploration. Porting ILT content, blended learning or desktop-based eLearning content would all fit in this area. Many learning professionals seems to be a bit reluctant to enter this arena, though there is a huge way for their groups to stake a claim in a growing area and really establish ROI here. It’s clearly measurable when users make informed decisions on the job that result in productivity gains and safe results. We have observed that this reluctance may be due to the fact that “Just-In-Time” learning is not seen as being as preferable as ahead-of-time learning or traditional assessment-based learning in which we have become accustomed. Ideology aside, it’s easy to see that when you leave this type of learning off the table you are limiting your ability to affect organizational change at your company. Assess the landscape at your company to see how learning’s guiding hand can be used to create better apps for your audience. Mobile technology and smartphones have brought a world of innovation to us. GeoLocation, cameras and more (including the barometer with the Motorola Xoom), have created affordances for us that have never been available in our learning development opportunities. This concept means taking into account the new types of actions you can do with these devices that were not possible prior to their introduction. Our original RabbleBrowser application, or the very popular Layar and Starry Night, are some examples of this kind of mobile learning content. This can be a tough concept to visualize in your company, as it does require some deep knowledge of both your audience’s needs as well as the mobile technology landscape. This method can also be one of the most satisfying examples to see successfully deployed, simply for its daring approach and game-changing effect. Social is intrinsically mobile (or mobile is intrinsically social, depending on how you look at it). The devices being brought into your company are being used to learn and socialize on your network. If you are not planning on taking advantage of this huge opportunity, you are missing a big chance to bring your organization’s learning goals to your learner’s pockets. Consider how users create and curate content on your network and conceptualize how to take advantage of that via social tools formatted for mobile device usage. It’s a match made in heaven, and everyone will benefit. Focus on all four of these content areas and your potential for successful mobile learning implementation increases dramatically. You may have noticed a number of recent posts from a couple of new names at Float Mobile Learning. We’ve recently brought on Gary Woodill, Ed. D., and Jeff Tillett to the Float team. Gary brings expertise in insight and research in mobile and learning to Float, and Jeff’s background in learning and development at one of the world’s leaders in mobile technology, T-Mobile, makes him a fantastic asset. We think you’ll like what they have to say. Be sure to flip through some of these guys’ posts and we’re sure you’ll agree. Last month, Float co-presented a webinar on “Navigating the Waters of Mobile App Publishing.” We had a great response. We continue our free webinar series and open it up to “Mobile Learning Conversations” – presented on Tuesday, October 11, at 1 p.m. EDT. We’ll be pairing up Jeff Tillett, Mobile Strategist for Float, and Gary Woodill, Senior Analyst for Float and owner of i5 Research, to delve into a mobile learning topic, Instructional Design for Mobile Learning. This is sure to be an insightful hour and packed with great takeaways that you can use immediately in your organization. We’ve teamed up with America’s leading organization for training professionals, ASTD, to create a groundbreaking web workshop series, The Essentials of Mobile Learning. 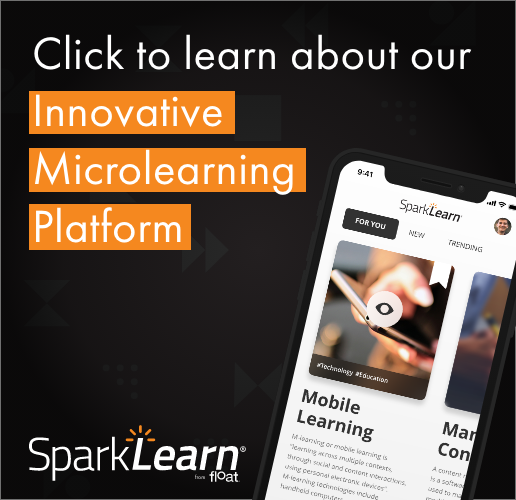 This series, with more information available here, aims to get you the information you need to get started quickly in the world of mobile learning. This program is appropriate for any learning professional or trainer interested in learning how mobile learning is changing the training and development profession and how to leverage it for their own programs. The program will take place over three successive weeks, with a 90-minute duration for each interactive, web-delivered session. The incorrect dates were sent out in the September 2011 Newsletter. These dates are accurate.